This article was researched and written in November, 2010. American movies get bigger every year, boasting new technology, brighter stars, or better scripts. Under the flash and bang, however, every movie is just the continuation of the age-old traditions of entertainment. The elements are the same: a story to be told, actors to tell it, and a stage to play it out on. The stage – the setting – is a character in the story in its own right. That’s where Chico, California, comes in. As an actor playing out a story on film, this area has quite the resume. The Internet Movie Database, IMDB.com, lists over thirty movies using the Chico area as a backdrop, from one end of Butte County to another. Chico has stood in for many places, from the deep south of Georgia, to the deserts of Texas, and even the storybook perfection of Sherwood Forest. It turns out that the area has the lucky distinction of standing out while blending in; it could be anywhere in the world, from the right camera angle. Chico has been used as a filming location since around 1915 with a silent movie called The Folly of a Life of Crime. The Chico Chamber of Commerce boasts that Annie Bidwell herself granted permission for the movie to be filmed here, though Amber Drake, Guide Supervisor at the Bidwell Mansion, reported there is no known record of that in Annie’s extensive diaries. Movies that were filmed partially in Chico range in status. Butte County has production ties to three movies selected by the National Film Registry as significant representatives of the range and diversity of American film heritage: The Adventures of Robin Hood, Gone with the Wind, and The Outlaw Josey Whales. These movies broke new thematic ground and are known worldwide. Some were blockbusters, like The Adventures of Robin Hood, which won three Oscars and brought in over $4 million for Warner Bros. Studios, according to the documentary Welcome to Sherwood. Some are so out of date that they are hard to find in video stores today, despite their one-time star-power, such as Jimmy Stewart and the movie Magic Town. Others are more obscure independent enterprises, like the 2010 web-series Cult 11. As an actor, Chico finds itself in notable company. Why would Hollywood executives chose to spend time and money hauling their productions from Southern California to the little town of Chico, eight hours north by truck? 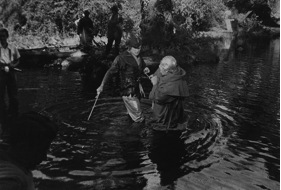 Letters between production managers and studio executives indicated that it really was a hardship to film in Chico, and when the movie The Adventures of Robin Hood changed directors, replacement Michael Curtiz reshot many of the scenes in the closer Lake Sherwood, CA. The easy answer to the preference for Chico, for at least the 1930’s Hollywood executive, was that while Warner Bros. Studio executive Jack Warner was not a Chico native, he apparently liked it up here, according to a photo clipping provided by the Chico Museum. The documentary Welcome to Sherwood credits The Adventures of Robin Hood art director Carl Weyl with the ultimate decision to use Chico, however, specifically because of the scenery already in place here for him to work with. As a resident of Chico, there are many things that seem photogenic about the area that I had taken for granted until I started digging around for this assignment. Things I see every day seem mundane through repeated exposure, but when captured through a camera lens, a variety of pieces come together in to a different focus. For instance, the Chico Airport is flat land surrounded by warehouses. Historically, the airfield has some intriguing stories to tell, but there’s not much visually interesting to Chico’s Foreign Exchange Zone – until you note the looming creep of foothills. Beyond the tarmac lie fields that stretch to trees. A few minutes’ drive above it is Richardson Springs, all green grass, rocky bluffs and crooked trees that once made for a beautiful vacation spot and is now home to a church camp. Our buildings are a mix of old and new, with parts of downtown still holding the charm of their age by design. They may get fresh layers of paint, but the classic styles are being consciously preserved, as evidenced by the careful rebuilding of the Diamond Hotel and the active preservation of the Senator and El Rey theaters. They, like the Bidwell Mansion, and the Miller Mansion, offer picturesque flashbacks to another time. In contrast, the 1995 movie Stolen Innocence used downtown Chico for its run-down motels, the generic Golden Waffle diner, in addition to local truck stops. 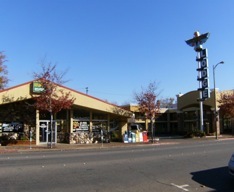 Old motels next to new hotels, trailer parks next to grocery stores, churches in strip malls- Chico is very eclectic. A few churches in very old buildings are on the historical register. The Esplanade is lined with trees and old structures, flat; it was once open wheat fields. According to Ms. Drake, John Bidwell would sit in the tower with a spyglass to see his brother Daniel’s property, now known locally as the Miller Mansion, at the other end of the long road. The university is cluttered with historical buildings, colors and shapes unnatural to Chico; all of their styles can be found in other places of course, but not blended together with that Chico panache. If nothing else, Chico is a city of trees, green leafy things growing everywhere, whether they were planted there by human hands or squirrel paws. Parks show up in unlikely places, even near the freeway, because that’s where the trees are. The freeway, Highway 99, wasn’t there at all until 1963, and they built it over Robin Hood Glade. Every day thousands of cars drive through Sherwood Forest without even realizing it. 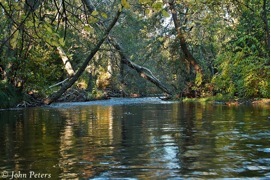 Chico works well as a film location because of its variation in flora. Many of the trees and other plant life in Chico, Bidwell Park in particular, are not native to Northern California. Local residents like myself take for granted having redwoods share space with magnolia trees, taking it in as just another element to the backdrop of our lives; I don’t necessarily pay attention to the fact that it is unusual to have coniferous redwood trees standing tall beside sycamores, oaks and Japanese maples. They have simply always been that way here. Professor Lois Bueler of California State University, Chico, recalls being struck by the odd variety shortly after moving here. While on a bike ride, she stopped at a yard with both a mission fig tree and a blue spruce. Neither tree is native to the North Valley, yet they grew in that yard, healthy and old. Ms. Bueler informed me that John Bidwell’s interest in agriculture and horticulture led him to plant many different kinds of trees and plants in the Chico area, just to see if they would grow. Around one hundred years later, it is clear that the climate will support plants from other climates, providing they are allowed to adjust after planting. Sure, movies are fun, but there are bigger things to figure into daily life, so why do the movies matter to Chico? They come and then they go, and who knows when they’ll come again. There’s nothing important about that, right? Well, not exactly. Movies filmed locally bring money into the area. The cast and crew need a place to stay for the length of production, a roof over their heads and food to eat. They’re a horde of tourists who arrive together, leaving again all at one time. Welcome to Sherwood reports that it took The Adventures of Robin Hood crew six weeks to film the necessary scenes at Bidwell Park. Other articles add that during that time, the production crew went out to eat at local restaurants, participated in local fairs and events, and frequented local bars and parties. The article notes that they arrived on the longest train of people and equipment to ever leave Hollywood for a shooting location. The Chico Enterprise reported that on Friday November 5th, 1937, a special dance was organized by the city chamber of commerce as an official farewell to the production company, open to cast members and to the community in general, with enough space to “accommodate about 1000 couples.” That‘s a lot of mouths to feed at a single event. That one movie impacted the development of many Chico businesses, from the train station to the hotels to the bars and diners and restaurants, for an entire month. While other movies since film on a smaller scale, with less fanfare, they still reliably drum up local business. Warner Brothers Studios impacted the Chico community so profoundly that, according to an article in the Chico Enterprise from November 3rd, 1937, the Chico city council unanimously decided Ivy Street should be divided and renamed in the studio’s honor. Thus, today the infamous Ivy Street turns in to Warner Street just at the bridge that, incidentally, crosses the creek. Thankfully, Little John does not guard this bridge and we are all free to cross. At the time Disney Channel’s Under Wraps was filmed, I was a student at Chico Jr. High. The movie used lead actors who were jr. high school aged themselves, and filmed “across the street” from my school at the more photogenic Chico High School. Naturally, a jr. high school setting, in order to be realistic, must be populated with teenagers. Casting calls were put out and ‘extras’ were drawn from the community. I still laugh every time I watch that movie because one of my classmates back then landed a speaking part, just a walk-on, but better than an extra. My English class was all abuzz about it for weeks; Ryan had finally found his break! He was moving up from community theater and had landed a movie! Now, though, the effect is different. Like the city itself, a young Ryan Schofield is forever locked in moving pictures, a moving yearbook, a reminder that yes, I too was really once that young. Another amusing contribution from Under Wraps was the inclusion of local businesses in the movie’s shots. 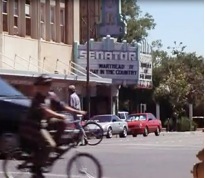 Campus Bicycles, the Chico Area Transit System (now known as B-Line Transit), and the Senator Theater all made it in to the movie without having to hide their business names behind fake signage. Given the Disney Channel’s broad reach, and that it regularly plays the movie around Halloween, people across the globe have seen the logo for a Chico bicycle shop, and could possibly recognize the old theater’s marquee, depending of course on if they enjoyed the movie. Behind the Scenes: How do they find us here, anyway? The Chico Chamber of Commerce web page lists Alice Patterson as their Media Maven, but really, Alice is their Communications Manager. She is the media specialist, promoting the Chamber of Commerce across all mediums, from print, to video and internet. Her “other hat” is as Butte County Film Commissioner. According to her biography on the business networking site Spoke.com, Alice moved here to attend CSU Chico, graduating with a BA degree in Journalism and a minor in English. Since 1998, she has pulled double duty at the Chamber, serving as a “point person” for anyone interested in filming in Chico in addition to her job as Communications Manager. Though not officially assigned by the city to field the traffic, Alice says the Chamber receives requests from filmmakers and location scouts for the California Film Commission on a daily basis. She discusses their project’s needs, suggests potential locations for their scouts to look into, and helps to determine if any city services will be needed for the shoot, such as shutting down roads. If they wish to do their filming in certain areas, such as Bidwell Mansion or Bidwell Park, Alice puts them in contact with the appropriate agencies to seek the required approval. The Butte County Film Commission does not charge for its services but some projects need permits or other assistance from the city, such as special effects which require onsite police and fire crews and are charged for. Alice said there are no major projects in the works at this time. Like other local residents, Donovan St. Claire was surprised to learn that Clint Eastwood’s The Outlaw Josey Wales was filmed in Butte County. An employee of All the Best Video (a local video rental store), the 22-year old college student said that it wasn’t the location that surprised him, but the movie being one so well-known. Donovan said he had grown up using an old movie-set as a hang-out spot with his friends. They called the hard-to-reach area “The Chimney,” owing to the solitary brick chimney left behind after the production crew burned down the house that had been attached to it. They knew the house had been destroyed for a movie thanks to local lore, and Clint Eastwood was rumored to have been involved, but Donovan hadn’t learned which movie had really filmed there from those stories. That site is “somewhere between Oroville and Las Plumas,” not visible from any public road. The only way to get there is to trespass on privately owned property, but Donovan was confident that the chimney would still be as he had left it a few years ago. He seemed quite impressed to learn that his old hang-out had actually been burned down by Clint Eastwood. My attachment to all things movies likely traces back to 1995 when I accidentally stumbled on to the filming of Stolen Innocence at 7th and Main Street Downtown. I was shooed off by walkie-talkie-wielding crewmen, but I never really left. I live in Chico, a city far, far away from Los Angeles, yet it lands a movie gig every few years. 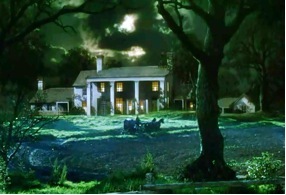 There’s lots of lore about where Gone with the Wind really filmed what scenes, what trees Errol Flynn climbed as Robin Hood, or whether or not Bidwell Mansion was ever actually in a movie, but no concrete answers. Those details were lost over the years in the shuffle of paperwork as properties changed hands. What we know for certain is that Chico could be peeking out from behind the movie magic, in plain sight and cleverly disguised. It blends in; it looks like a little bit of everywhere. Chico locals get to say that we grew up living just down the road from Tara, playing in Sherwood Forest, chasing a Mummy around the halls of Chico High… that’s pretty unique.